Oğuz Tosun is studying environmental engineering at Middle East Technical University in Ankara. In his freshman year, he became involved with the European Students’ Forum (AEGEE), which changed his life and set him on his current path of activism. Through this organization Oğuz has participated in several international youth programs with different focuses including topics on environment and democracy. He was elected as one of the board members of AEGEE-Environmental Working Group at European level in 2014 fall. In 2015 summer, he was awarded a fully funded scholarship to participate in “Study of United States Institutes: The Institute on Global Environmental Issues” which was held in Hawaii, Colorado and Washington D.C. by East-West Center. Additionally, he has worked for Europe on Track of AEGEE-Europe as financial director. 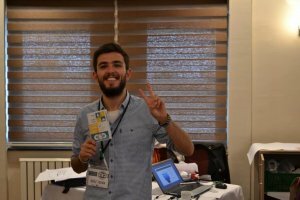 Since February 2016, he has been running the Change for Climate (C4C) project with eight team-mates to raise a sustainable awareness on climate change among Turkey’s local communities. Through C4C Project, he and his team have organized one campaign and four training courses including one that is financed by the U.S. Embassy in Ankara. Recently, C4C Project was awarded another $5000 grant for its newest training “Climate Simulation Program (CSP)”by the U.S. Embassy in Ankara. Due to Oğuz and C4C Project’s efforts in spreading Climate Interactive’s educational module on Climate Change and Systems Thinking such as The Climate Leader and the World Climate Simulation, he has been appointed to become a World Climate Ambassador.